Matthew Knoll shares 451 square feet of living space with his girlfriend, Emily Wu, and their dog, Maui. Elkanah Reed, 28, single, and the cofounder of a Scoopr Media , a social-media marketing startup, wants to get to know himself better. For help on his journey, he’s not turning to a guru or a meditation coach, but rather to his studio apartment. “Living in a small space allows me to do that — it forces me to focus my life,” he said, as he stood in the middle of his Innovation District rental in the glossy new 315 on A apartments and gave a (very short) tour of his “living room,” “kitchen,” and “bedroom,” all essentially one. 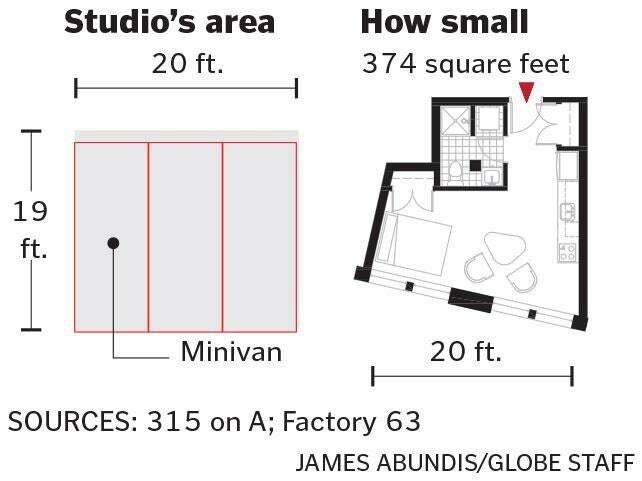 As rents approach stratospheric levels in many areas of the city, Boston is allowing construction of smaller apartments — studios in South Boston’s Innovation District can be less than 450 square feet. But those who live in Tweet-sized units know it takes certain adjustments, and they have advice to offer — wisdom that even McMansion dwellers might find beneficial. Among the lessons: Don’t eat breakfast, lunch, and dinner in bed (even if it is in your “kitchen”). Take a zero-tolerance approach to clutter (buy a new T-shirt, offload an existing one). Host only people you like. But nods to practicality are only part of it. Cozy living can bring deeper wisdom. “This might be getting too heavy, but you can apply the same intentional [decorating] philosophy to a lot of other things,” said Collins Dunn, 32, who lives in a studio in the Innovation District. 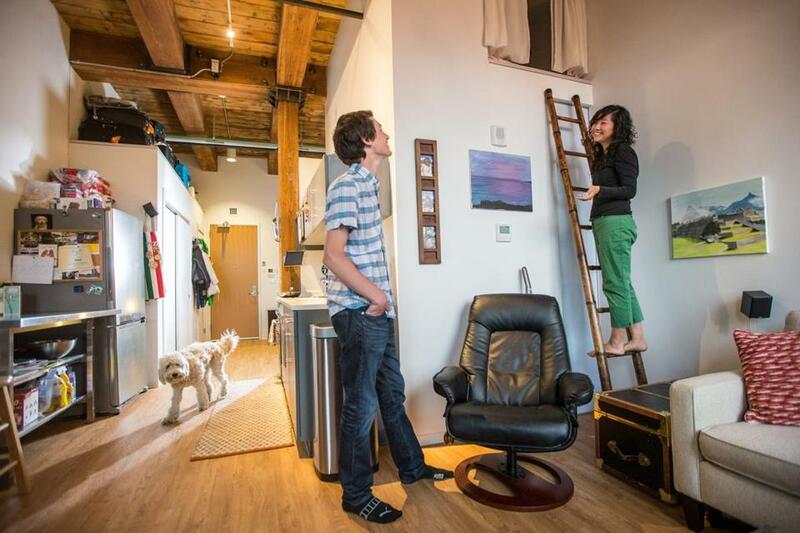 DISCUSS: Could you live in a micro-apartment? For Dunn, a financial news analyst, that translates into really thinking about how he spends his time, and with whom. “You let in things you want, rather than because they just happen to be there,” he said. While the creation of these units is just beginning, developers expect them to be popular with young professionals more interested in proximity to restaurants, work — and other young professionals — than counter space in the kitchen. Boston’s new small apartments aren’t as micro as in some cities — San Francisco allows living spaces of 220 square feet — but they do represent a change in city policy for new construction. In late 2010, the city approved construction of “innovation units.” These can be below 450 square feet, but are permitted only in the Innovation District and in buildings with adequate shared amenities, such as lobby or roof-deck space. Nearly 200 are planned; about 25 have been built. Additionally, in 2013, the city expanded the areas where developers could build “metro studios” as small as 450 square feet. They’re now allowed in outlying neighborhoods as long as they are within a mile of public transportation. Perhaps no one in the city is better positioned to see the mindset it takes to live in a small space — albeit one with soaring “high performance” windows and 15-foot ceilings — than Jessica Ryan, a leasing agent for 315 on A and the nearby Factory 63, on Melcher Street, where some studios are as small as 374 square feet. From her desk in 315 on A’s lobby — not far from the concierge and a bowl filled with dog treats — Ryan has seen women exploit the tight space as an excuse to force boyfriends to shed a dingy futon or a foosball table. “Living in a small space can be freeing,” Ryan said. Living small is easier than it was even a decade ago. Bulky TVs have gone flat. Kindles are rendering bookcases obsolete. Laps are the new desktops. And, in high-end buildings, the lobbies, with their dedicated conference rooms and private seating areas, are the new living rooms. “People don’t only think of their home as just what’s behind their front door,” Ryan said. In fact, the new residential projects are planned for those who may consider their private space as something akin to a dorm room and view shared space as a way to meet neighbors and network. Over at Factory 63, where Matthew Knoll shares 451 square feet of living space with his girlfriend and their goldendoodle, Maui, Knoll used the lobby this past winter to study for his master’s degree in aerospace engineering — and also as a dog park. “All the dogs would run around the chairs,” Knoll recalled happily. Although the Innovation District’s small studios are getting all the attention, they’re merely the on-trend, high-end, big-windowed, tall-ceilinged, well-laid-out versions of existing tiny spaces spread around the city. Grandfathered in, those studios require neither city approval, nor, apparently, a cutting-edge website highlighting the building’s sustainable roof deck (with native plants) or on-site bike parking. Another difference: the rents. The BRA’s director of planning, Kairos Shen, said the city allowed developers to go below 450 square feet in an attempt to make city living affordable for young workers. 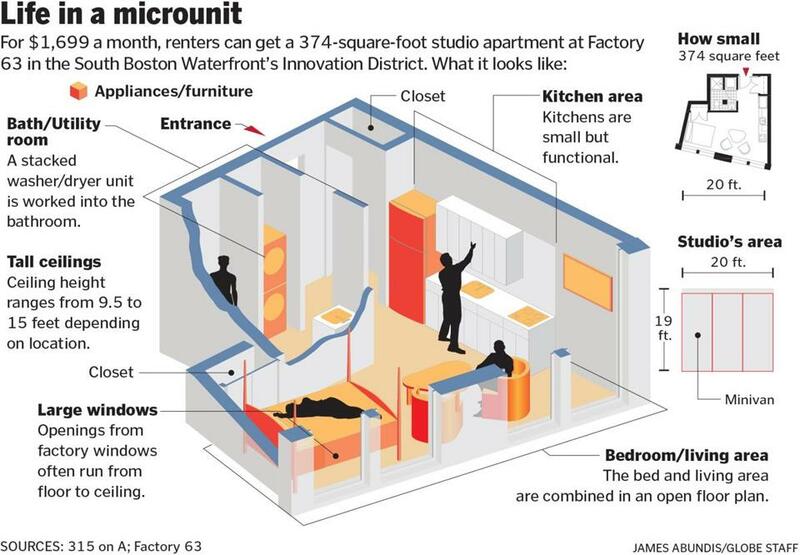 But the apartments in the Innovation District can be so pricey — at 315 on A, a 464-square-foot studio rents for $3,019 per month, and a 374-square-foot place at Factory 63 goes for $1,699 — that so far it’s the developers who are mainly benefiting, he said. But many who live in studios say that the price per square foot may be less outrageous than it sounds when an additional factor is considered: time spent in the apartment. “I’m always outdoors or in the lobby,” said Carly Yarbrow, a wedding photographer who shares a Factory 63 studio with her mini husky, Harper, who’s also reportedly a fan of micro living. As living small becomes ever trendier, services that cater to high-end micro dwellers are springing up. In Boston, Michael Cappelletti recently started Cubiq , a self-storage company that takes the “self” out of the equation by sending “concierges” to deliver and pick up containers, eliminating the schlep to the storage facility. Think Uber for sweaters. Matthew Knoll stood in the kitchen area while his girlfriend, Emily Wu, played with their dog in the bedroom of the 451-square-foot home at Factory 63.